Be the villain of the story is not completely original, there are plenty of games of this subject and some are pretty good. Rack n 'Ruin is the last to fall into our hands from that premise, we are not exactly the Lord of the Underworld but yes one of its henchmen, Rack, which like the rest of hell its purpose is to plunge the world in ruin, corrupt. The problem is that the craving Rack destruction of the protagonist is destroying planet, and all that remains is a belt of asteroids and moons. His teacher, interested in slaves, gives an ultimatum to Rack: a small world must be mastered. However, Rack has no intention of obeying Ruin. Rack n 'Ruin is essentially an action game top view, very similar in approach to many games 16-bit era, and adds some aspects of personalization and items or scan with healthy claim to add depth without becoming confused with the role. Unfortunately, it is halfway to what it promises. The game begins by showing the basic movements and different attacks. The simplest is to a shot, but more like a sword alternative for short distances. Standing a few minutes to realize not too satisfactory control, and is not because it is awful or unplayable, but because there is a nice answer. There are subjective and objective reasons for this, in the latter say that our character points in eight directions, instead of using more sensitive angles, which is detrimental to the freehand aim. You may aware of this management that feels rough, developers have included a button that automatically draws a nearby enemy. Not comfortable constantly pressing both triggers to fire in moments of action and multiple enemies, where also the choice of target may not be the right-and rectify takes a moment. When dealing with a system based on shot and compulsively release button mashing, is a bit confusing. Why not use a control with two sticks? Why not activate the digital crosshead for navigating menus? Mysteries Rack n 'Ruin. In this adventure we travel dungeons that are actually pretty labyrinth of forests, villages and natural environments that constantly remind the map you might see in a classic type action RPG The Legend of Zelda, which attempts to plagiarize in various ways without much luck. No whole environment is accessible from the beginning, no mechanism that prevents pass through certain areas, which translated into practice means that we must investigate the field, defeating bosses and return to those places that are blocked with a new ability to access around. The pity is that there is no clear way to see our next goal, it is to try and spin through the woods until you get to the right path. In small villages find some side characters to speak. They never have anything interesting to say except for vague descriptions of the place to investigate and to be honest, it seems a strange element in gameplay adds nothing, slowing the action--the main section. There is a repertoire of aids to give a little more variety to our imp, pumps or objects that add shot around us, among other items. Rack also offers a shield for times of trouble, and magic bar limits the abuse of some skills. The point is that Rack n 'Ruin makes no effort to invite use imagination, rather the opposite. There are no real puzzles to exploit the weapons or skills, and most tests usually involve moving hubs to switches, nothing that really can be considered as a challenge to intelligence. During combat either, as the quickest way to defeat most enemies usually the current-mill. Opponents who incidentally are uninspired, some as uncomfortable as a kind of leech which is divided into more creatures and leaves puddles harmful blood; does not shoot projectiles and just attacked, but still takes a while to defeat. That is another defect: the enemies are generally simple, and the difficulty comes because of its high number. From time to time a flash of something more variety do appear on the enemies, wizards that create a protective peers or knights with an area of extensive damage shield, and best situations are, theoretically, when a multitude of shots listed in screen, similar to bullet hell genre-a hail of gunfire that covers most of the screen. It is in these situations is evident when other details related to the control not live up to this requirement, which is that the speed of Rack is limited. An evasive move or how to accelerate the steps are missing. In fact, another aspect seemingly insignificant. By defeating creatures, they leave spheres to be collected, which don’t attract "magnetize" a very old trick for the player to receive a reward without effort-Rack n 'Ruin gives the feeling of a prototype that is still a layer of polish, which has not been tested enough by its authors. It is not normal that the proximity of the camera prevents viewing comfort routes, not because carry secret places. The Art of Play in principle is good, participated Tyler Hunter, a former worker know Blizzard World of Warcraft and Diablo III. What I have found it inappropriate and too generic. 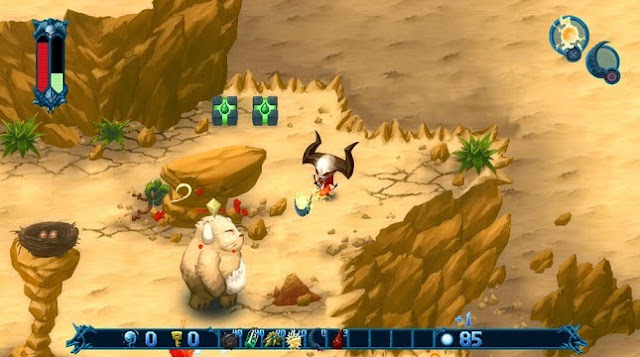 Leaving aside the poor design of the enemies, environments exude an aspect of Flash game or web browser that does not provide a special charisma. The positive side we find different thematic locations within a connected world and ongoing, and although not a huge map, it is always good to see some diversity in addition, no alternative version corrupted - areas. Any player may also grant merit away from the pixel-art aesthetic that is so overused these days. The music virtually the same: an atmosphere lacking in personality. Too light for an action game, too inconsequential as to mark the user. There is hardly voice setup instructions with some sporadic words use to set the tone of the characters. There translation for dialogues are accessible to all users. There is a large untapped potential with the idea Rack n 'Ruin. Lifespark Entertainment has failed to concentrate on a clear direction: the component of action is very decaffeinated and exploration, customization and gameplay depth is far from offering an action-RPG. Either option would be valid, but the midpoint where this adventure falls knows little. Above all, the sharpest defect is in something as essential as is the control and the constant bombardment of creatures as a resource to raise or lower the difficulty. Failure most importantly, the gameplay design.